It has been really stormy here with torrential rain and howling winds, which is a bit of change from last week, when we even went to the beach for ice-cream. 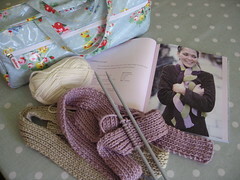 Nothing like a cold day to get the knitting needles a-clacking! 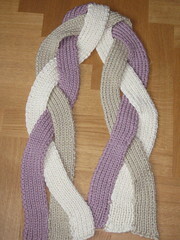 So I finished the scarf. I could have made it in the evenings in about a week if I had tried. Note: I am a very slow knitter. But yes, it has taken me a year. 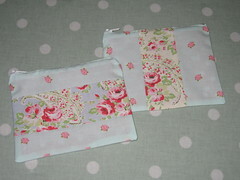 I also made some more of the zipped pouches (not again!) and hair accessories for my friends daughters, their birthdays are coming up in the next few weeks. After the success of last weeks gift giving I have decided to keep to what I know, and the girls are getting the same. I still have to make the headbands but that will have to wait until another day. 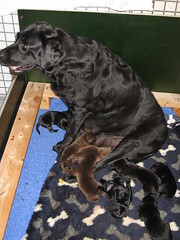 Incidentally the pictures are not great as there has been rubbish light here due to the storms! 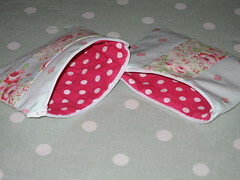 I am also aware that this blog is called bake and sew, yet I haven’t done any baking recently. Well the freezer is empty, and the children are fed up with what I am putting in their lunch boxes so I will try and make same cakes and cookies over the next few days. So check back soon for some yummy pics!